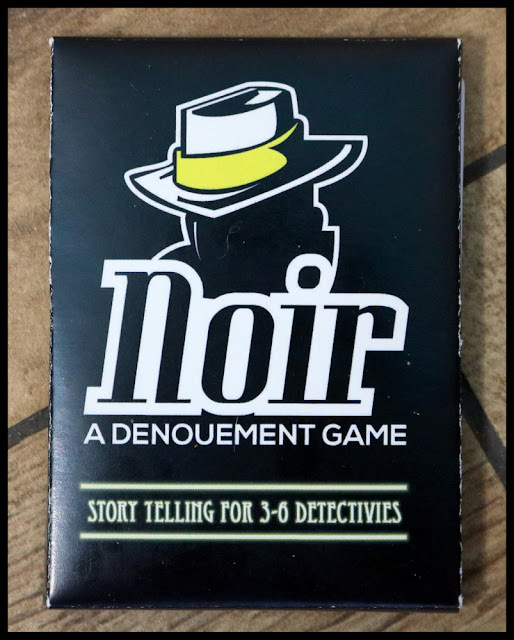 Noir is a "denouement" game for 3 - 6 Detectives that lasts only a few minutes per round. 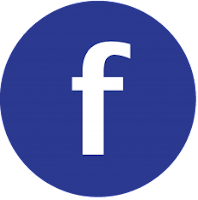 The denouement mechanic is a special type of storytelling game, where the key elements of the stories events are determined by the game, and the players must weave them together in the most inventive of ways. In Noir, the game’s Judge sets a Victim and a Killer. 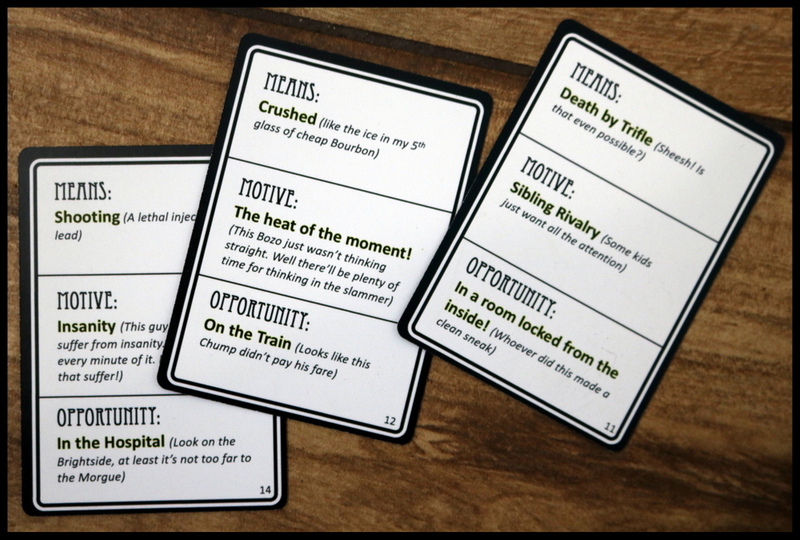 Then, players must select a Means, Motive, and Opportunity from cards in their hand. They then use these elements to tell the story of how the killer did the deed. Preferably this is delivered in the style of a detective in the third act, revealing to the audience and assembled cast just how clever they were to figure it out. The stories are cross-examined and picked for holes by the other players before the Judge settles on the best, using whatever criteria they prefer. Noir is packed with a grim cast of Femme Fatales, gum shoe P.I.s, mean Mobsters, and hardened Hit Men. The play throws up stories which are by turns dark, hilarious, inventive, and always, always memorable. At the bitter end, the best denouement of the game wins! The short-but-sweet storytelling card game Noir is set in the world of hard-boiled detectives and the seedy underbelly of life. 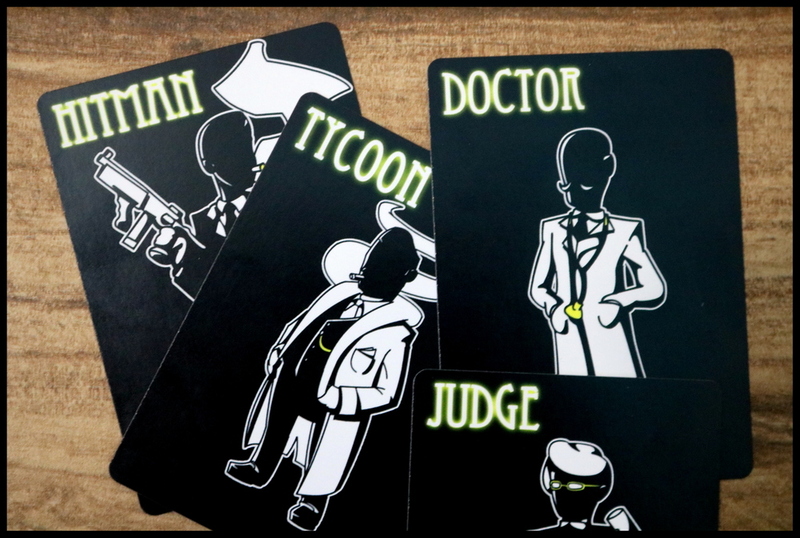 The cards have simple, evocative silhouettes to draw you in, but a great deal of the theme depends on the players telling the story! Noir is super simple to learn, to play, and to set up. The rules are cleverly printed on each flap of a pack-of-gum-like tuckbox and take only a few minutes to read. All that's involved to set up this storytelling-based game is to shuffle the deck of eighteen cards and deal three to each player. The mechanics of Noir are very basic, allowing the players' creativity to shine through. On the back of each card is the title and image of a character. Each round, there is one Judge, who chooses two of the three characters on his or her cards: one person to be the Victim, and another to be the Killer. In our first game, the Psychiatrist was the hapless Victim, and the Socialite was the cold-blooded Killer. On the flip side of each card are three elements: Means, Motive, and Opportunity. After the judge has announced the identities of the Victim and Killer, the other players take a minute or two to come up with a story that uses the Means from one of their cards, the Motive from another card, and the Opportunity from the remaining card. I decided that the Psychiatrist had died due to Exsanguination, due to the Socialite's Psychotically Competitive Streak while meeting with her In a Secret Hideout. Each player now gets a chance to tell their story with all the embellishment and gritty flair of a noir detective narrating his most famous case. After all stories have been told, the Judge chooses the best version of the crime. A new round begins with a new Judge. Once each player has had a chance to be the Judge, all players can vote on the best story of the night to give a Final Judgement. Noir consists of eighteen cards, each with a black back featuring a white silhouette of a character with their name printed above, and a white flip side with text explaining a Means, a Motive, and an Opportunity. The artwork is clean and clear, providing enough ideas for the characters but leaving quite a bit open to the imagination. The fonts fit well within the noir theme. 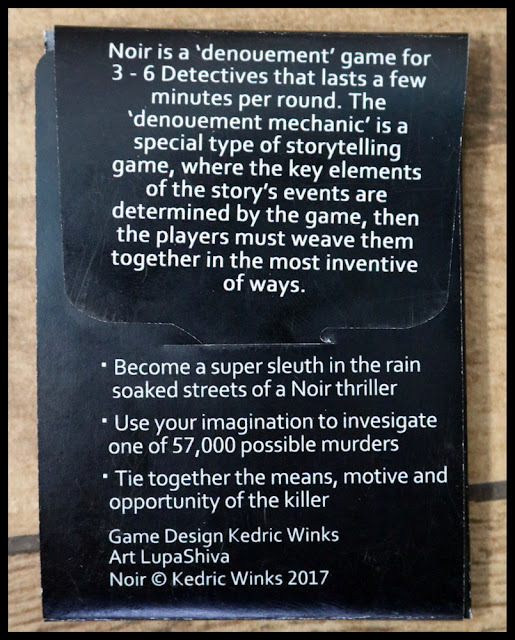 The cards for Noir come packed in a box (more like a cardstock envelope) that opens on the back with a tucked tab, flaps fold up and down, and two more flaps fold out, revealing the pack of cards. The rules are printed on each side of each of these flaps in a great use of space that eliminates the need for a separate rule sheet. 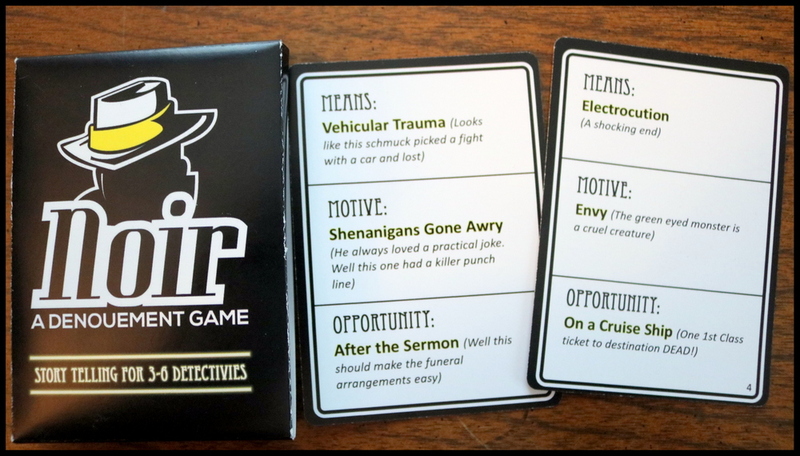 Currently, Noir is available as a print-on-demand order from The Game Crafter, and I was pleased with the quality. 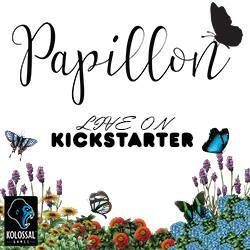 Files are also available if you choose to print and play your own copy. I enjoy quick games, storytelling games, and detective stories, so the combination of all three in one game really hit home for me. The simple cardboard fold-over box holding just eighteen cards makes Noir a great game to take in my bag when we are at appointments, out to eat, in the car, or otherwise on the go and want to fit in some storytelling and game play. The range of characters and elements is good, and there's even a tiny glossary on the box, explaining the meanings of defenestration, exsanguination, vivisepulture, and bludgeoned! 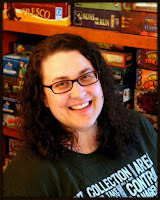 I'm also a homeschooling mom who enjoys gameschooling with the kids - using games to build academic skills - and Noir fits in very well for me to playfully help my kids (now 11 and 15) to work on creativity, vocabulary, plot, character development, extemporaneous speech, and other great skills as we all enjoy crafting our tales of grisly demise. My teen in particular said Noir would be a definite hit with his friends, who already enjoy creative writing and role-playing games. We wanted to see more! The kids sometimes were frustrated that they couldn't use the Motive and Opportunity from the same card and would like to see a bigger mix of characters with more elements and possibly some of the same elements reused in different combinations. They also thought that if we played Noir too often, they might get in a rut using the same card combinations. Everyone we've played with so far had only that one negative comment - that the deck is a little too small, and having more cards would increase replayability. Noir is very well done for a self-published micro card game. 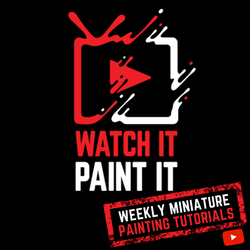 It will definitely see repeated gameplay for us - particularly when we are out and about and need a fun time-filling game, or when I want to work on creative storytelling and verbal skills with my kids. We'd love to see it expanded to a slightly larger deck. 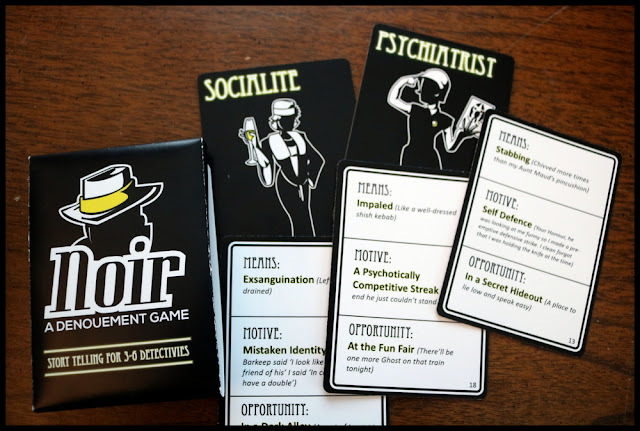 Fans of storytelling, extemporaneous speech games like Snake Oil, Apples to Apples, or Gloom will enjoy Noir. 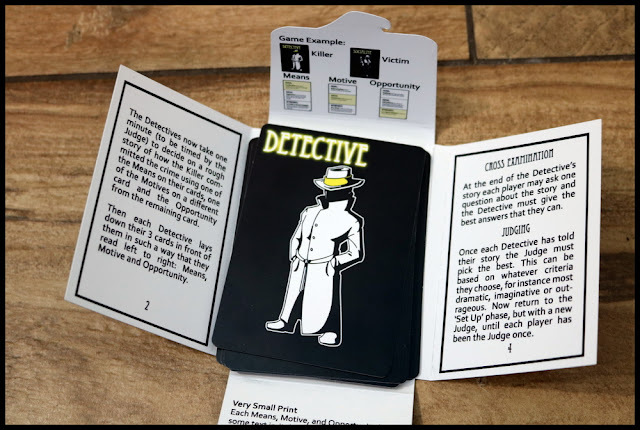 Those who enjoy detective fiction and mystery games like Stop Thief, Mystery Express, or Burgle Bros. may enjoy it too! I am giving Noir 7 out of 10 super meeples.